Supportive therapy for acneic skin conditions, to reduce swelling and local inflammation. Antibacterial properties. 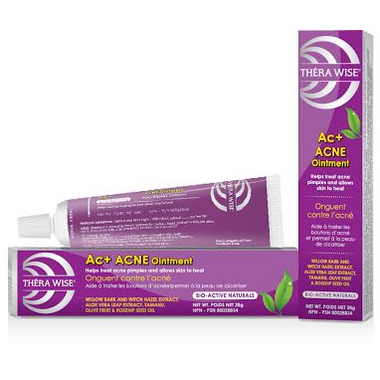 A Wise choice for gentle, balanced supportive care for the treatment of Acne. This didn't seem to work very well for my son. I'm so glad I found this for my acne, my face loves it without drying up or getting a reaction to it like other acne products that have chemicals in it. Love the feel of this product. It has a very gentle and soothing cooling sensation for blemished skin. Can see it doing it's work already, very impressed! I have been using this product now for several years. My wife and daughters use it too. I grew up with bad acne and luckily only periodically suffer from it now. This product just plain works. I will continue to order it. I usually get a few tubes at a time to take advantage of Well. ca's free shipping deal. This product is gentle and non-drying. It should be noted in the ingredients list on well.ca that it contains a small amount of salacylic acid-- this might be a concern for pregnant or nursing women. I'm not too sure why my last review wasn't published on this product as I put the entire ingredient list from the Therawise website which I though would be helpful to people. I'll include it again, it is a great product and gentle too. I have very sensitive skin and this product is gentle enough that I can use it as a spot treatment or put a thin layer over my entire face before bed and leave on overnight. It really works! No harmful ingredients from what's been listed. I find the ointment a bit runny. Even when I gently squeeze the tube, a lot comes out and is wasted. I like its healing power -- it seems to reduce scarring if you put it on as soon as a pimple appears. I love this. I have very sensitive skin and acne treatments left my skin even more sensitive. I can barely stand to have anything on my face now, so I go with products with as little ingredients as possible. This is gentle enough for me to apply several times a day (though it leaves a residue when it dries so I usually just apply it at night) and it has helped my painful, recurrent cyclic acne tremendously. The acne comes back when i don't use it though, so it's important to still treat the underlying causes (I suspect my diet to be the culprit). I really, really recommend this product. Will definitely buy again! I found this to be over priced and wasn't very effective. Will not repurchase. The texture of this ointment is thick but it doesn't leave a film after application so it can be easily worn under foundation/concealer/powder. The scent is not overpowering and in my opinion it can be definitely used as a mattifying product (without drying out your skin) all over your face. It's not a miracle product but it will keep your trouble spots less irritated and angry looking. If you have been using benzoyl peroxide for years and trying to stay away from it by using natural holistic approach to healthy skin gives this a try! Broke me out more, I think it was because of the ingredient (Marine Algae Extract) which can clog pores. The consistency is a little strange at first, like a really light lotion. Most acne treatments can be heavy and have a very medicinal smell to them. This one is very light in scent and is not unpleasant. It also absorbs into the skin and doesn't leave a film. Really soothing and gentle but effective at the same time. Haven't found it to be drying at all. A good product, my skin soothed after using it, and it's pretty mild, I can use it 4/5 times a day! it minimized my pimple breakouts. it's really frustrating when i get really big pimples on my chin as in really huge and it comes by two's or three's, and they pop every after the first ones almost gone. my pimples aren't completely gone after using this product. i'm still getting really tiny pimples every now and then which for me is better. I have been using this product many times a day for about 3 weeks, and I definitely notice a difference in my skin. I do still get break outs, but they seem to be smaller and less frequent. They also seem to clear up faster. This is one of the best natural acne remedies I've tried. I really like this stuff. I use it all over my face at night, and it keeps me really clear! Very light texture, absorbs immediately and it looks like it does help my prenatal acne. I really liked this product. It dries out pimples and I think it helps prevent them from coming back. I've never used an acne product before since I only get blemishes on my forehead and chin and my skin can be rather sensitive. But I figured I'd give it a try for my trouble spots. This product works quite well. My red blotches look less red and angry after application. great product!! The texture is really light and it helps with my acne problems! I have acne problem since I was a teenager. Sometimes it is so severe that I have to stay home during the treatment. This cream clears up my acnes in 3-4 days, without over drying, in fact it's moisturizing. I really like the cooling sensation which I don't find in other products and it's truly organic! This is one the product actually works on my skin. I tried pretty much everything for acne treatment.even went to doctor.Now I ll order this product again. For best result wash the face with a cleanser. Love this product. I've had acne all my adult life. I've been on every medication out there ( eg accutane, benzol peroxide, retin A). I put this all over my face everyday and notice a difference after the first week. My breakouts are less. It may be drying for people with dry skin but I have oily skin and so no problem for me.